HANDSOME FIFTEEN-STORY BUILDING UNDER CONSTRUCTION. It is Located at the Northwest Corner of State and Madison Streets and Built of White Material in Ornamental Style of Architecture. 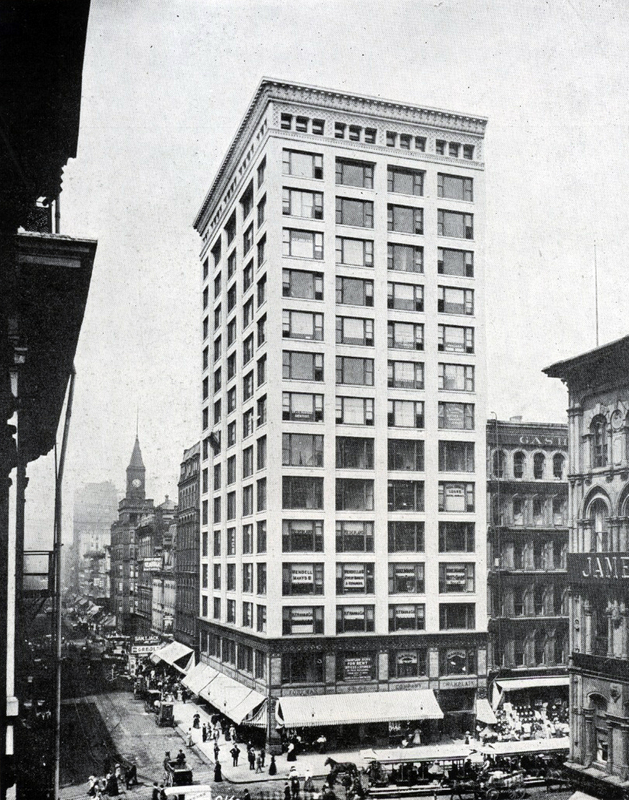 The fifteen-story Champlain Building at the northwest corner of State and Madison streets, now in course of construction, will be one of the finest steel structures in the city. The foundation is already in. It is believed the lower stories will be completed and ready for occupancy May 1 and the upper stories two months later. The picture given herewith shows it to be a handsome and imposing structure. The outside will be of a brownish-red terra cotta fur two stories and above that of white terra cotta. The windows will be large and the cases and frames covered with gold leaf. Materials have been selected that can be easily washed, the intention being to malke it a distinctively white and ornamental building. The in- terior will be finished in marbles and mosaic. Aldis, Aldis & Northcote, representing the leasehold trustees. have charge of the construction and will act as the agents after it is completed. The first floor has been leased to Foreman Bros. for a retail boot and shoe store. The next few floors will be used by various retail jewelers, furriers, and costume firms. The upper are to be used by and dentists. 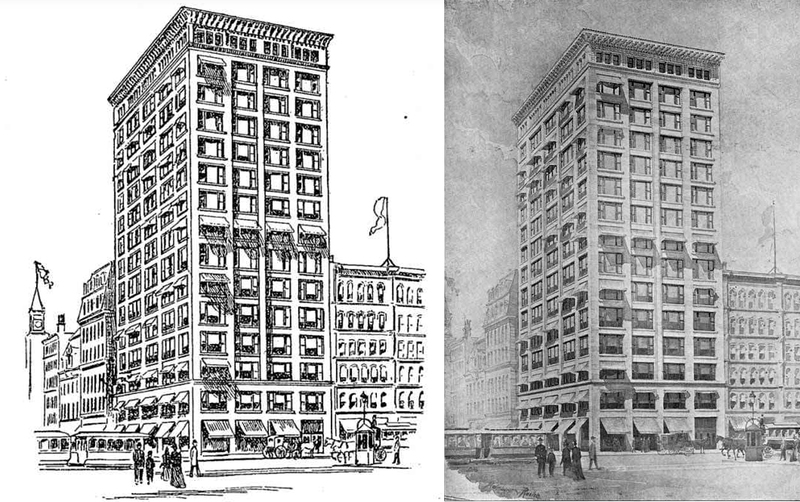 The building is expected to be under roof by Jan. 1, 1894. From a recent examination of the rusting of the 20-year-old steel members of the 15-story Champlain Building in Chicago, which has been razed to make way for a new structure, Holabird & Roche, the architects who prepared the original plans, conclude that the exclusion of air and moisture is essential for the preservation of the steel and also of the paint. The appearance of the rust suggests that it may have been formed soon after the building was constructed in 1894 and that it has not been progressive. Even if the worst case of rusting had been progressive and should continue at the same rate, it would be more than a century before failure of the member would result, according to the architects. They conclude that the present practice of encasing all structural steel in concrete or plastering it with Portland cement mortar, of separating the pipe shafts from the steel and of using greater care in covering terra cotta anchors, safeguards the framework of the structure for a much longer period than the probable economic life of such buildings. brick and terra cotta curtain walls. The contractor will be required to paint all ironwork and steelwork one coat of the best quality of mineral paint before putting up. After it is set, carefully go over all work, clean and remove all rust and dust and paint another coat of the same kind of paint. The condition of the paint varies from complete disappearance to “good as new.” So far as protection to the general structure is concerned the paint has deteriorated beyond all usefulness. In places there is no trace of it. Over most of the steel the paint still shows, but is broken up by rusted areas, in a few places it still has its color and luster over considerable areas. Even where small blisters showed in the paint, the steel underneath was bright and free from rust. There was no pitting ofthe steel observed, the rust occurring in flakes or lavers. Some pieces having areas from 50 to 100 sq. in. were removed from webs of I-beams. By weighing some specimens of rust scales taken from the inner sides of the webs of beam box girders not filled with fireproofing and reducing to the equivalent metallic iron, the loss due to corrosion is computed to be .007 to .009 in. This is very much greater than the average loss, as these specimens represented the worst condition except one case. One column in the first story showed rust amounting to perhaps four or five times the amount stated above. This bad rusting was along a pipe shaft where the steel was doubtless subjected to moisture or circulation of air. The footings were built of steel I-beams unpainted, embedded in Portland cement concrete. When removed they showed no corrosion. The pipes in the building were generally in fair condition. There is no record of any of them having been replaced since the building was constructed. However, one pipe, presumably a soil pipe, was so decayed that it could be broken as if made of earthenware. It was specified that the terra cotta be attached to-the steel frame “with substantial wrought-iron or copper anchors, and thoroughly embedded in cement mortar.” Wrought iron or steel was used. The anchors were generally in good condition, but some pieces were rusted so much that they were broken in wrecking. It is probable that these pieces were not well bedded in cement mortar at the points where the rusting occurred.